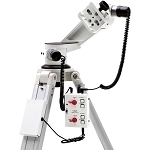 The Porta II Alt-Azimuth Mount with Train-N-Track Motor System from Vixen Optics provides a sturdy and stable Alt-Azimuth mount that is easy to set-up, use and transport. With its standard Vixen dovetail plate and 20 pound payload capacity, you can attach Vixen and many non-Vixen optical tube assemblies (OTAs), or bring multiple OTAs for a viewing session, and simply swap them to suit the subject. 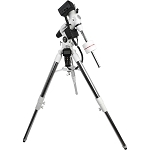 This most basic of mounts is ideally suited for quick astronomical or terrestrial viewing. Its two 120-tooth worm gears lets the altitude and azimuth travel a full 360° circle. The Porta II operates without locks and clutches, but rather with a friction system. This means you can simply move the mount by hand to quickly find your subject, then release it and let the Train-N-Track motor system take over. Since the speed that objects move varies depending on how close they are, the motor drive system features adjustable speeds on both axis. The popularity of the Vixen dovetail, means that many different OTAs can be mounted. To compensate for size and weight differences, there are adjustment screws on each axis to add more or less tension, based on the weight and distribution of different OTA sizes and styles. 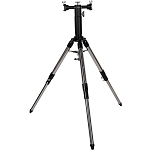 An aluminum 2-section tripod comes with the mount. It has an height adjustment range from 35.4 to 51 inches. A solid center bolt lets the mount also turn a full circle and makes the mount easily detachable from the tripod to mount on heavier tripods.